I’m a pretty shy person. 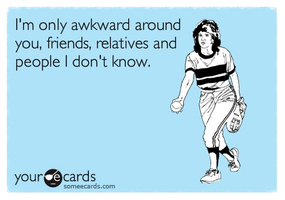 In fact, I will actively avoid situations where I’m being introduced to new people because it makes me so anxious. I’m one of those people who would rather sit at the back of a room and hope that no one notices me rather than nervously introduce myself to people. This is how I’ve been for as long as I can recall. Due to my complete social awkwardness, I do tend to worry about upcoming events and spend days concerning myself about what might go wrong and what I might do and say that will make everyone hate me. It hasn’t happened yet. Well, not that I know of, anyway. As an example: after my partner and I had been together for a year or so, we headed down south to meet his father, brother, sister in law, and newborn niece. Seriously: FOUR new people. AT ONCE. That’s three people more than I have the mental capacity to deal with. Added to that, the fact that they’re closely related to my partner, and it was more pressure than I could cope with. I was such a wreck that, a few hours after meeting them, I randomly burst into tears and couldn’t stop. And they were perfectly lovely. But, then again, it’s not other people that are the problem: it’s me. I understand that many people will find this completely bizarre, but living with severe anxiety is bloody knackering. The most stress-inducing situation, for me, is meeting new people. This is compounded by the fact that, despite manically checking the Internet every day, no one has yet managed to develop the technology to bring you that cloak of invisibility you so desperately want. Without it, you have to soldier on, counting down the hours until your ordeal is over and you can quietly return home and get on with all things you like to do that don’t involve Other People. That’s what I do, anyway. It’s not that I don’t like people: I do. I’m just scared of them. This is, obviously, not true of everyone. I have many friends and family that I love and that don’t cause me to lose sleep before meeting up with. It’s the people I don’t know that I have problems with. I’m fine with checkout attendants and randomly saying hello to people I meet on the street; particularly those with dogs: I love them (the dogs, I mean, not the people), but put me in a room with strangers, as is done as training courses and other hellish situations, and I will almost definitely come across as rude and standoffish. My Mum says I have a default face which screams “don’t even bother!’ (She was actually way less polite than that, but you get the general gist.) She’s absolutely right, of course, but that’s just my resting face. To walk around with a massive smile plastered on it would make me feel (and look) even less approachable. When I left my recent post in Scotland, one of my colleagues sent me a lovely email saying that he would miss various things about me, including ‘your complete indifference to most of your colleagues’… He’s spot on. Again, it’s not because I didn’t like them (I’ve met some lifelong friends), but I simply don’t know many of them well enough. Because I don’t know them, I tend to keep out of their way. By keeping out of their way, I’ll never know them. It’s a vicious circle. Until I’m forced to work with people, I will avoid them like the plague because I’m so nervous. Luckily, I had a fabulous Manager who, despite probably finding me decidedly odd and unfriendly, understood I wasn’t doing it intentionally and generally left me alone. Since leaving that post and moving to Wales, I have applied for a few jobs and wrote, when talking about my love of working as part of a team (lies, damn lies!! ), that I was ‘a quiet person’. I feel compelled to tell potential interviewers this so that they’re not surprised to find out that I am. When they finally say: ‘I’m sorry, Ms. Gorman, we’re not actually in the market for a scowling mute at present' at least I know they’ve had fair warning and off I’ll toddle, avoiding everyone’s eyes as I pass them in the corridor, until I make it back to the safety of my car/house/nuclear bunker. Oddly, I’m more than happy to write this and post it online. BUT, if you asked me directly, I’d panic a bit and then make a stupid joke to ease my nerves before totally changing the subject to something I’m more comfortable with — i.e. anything that’s not about me. Shoes, dogs and football are my preferred subjects, should you ever find yourself in the unenviable position of being left chatting to me at a party I was forced to attend.